My heart says of you, ‘Seek His face!’ Your face, Lord, I seek (Psalm 27:8). On Friday, I challenged us to make “seeking God’s face” our priority in prayer for one month. One of my friends took me up on that challenge. As we talked on the phone Friday afternoon, she spoke of focusing on a sketching she has of the face of Jesus with the crown of thorns on His head. It’s a large, powerful picture of the suffering Christ. With the faith of a child, she was actually seeking God’s face. With the faithlessness of an adult, I told her I was not actually expecting to see His face. I expected to see Him in the sunset and sunrise, the ocean and the sky, a friendly smile and a homeless person. My eyes were open to see Him however He wished to reveal Himself to me, but I didn’t actually expect to see His face. I really didn’t know what to expect. Well, on Sunday morning God got me up early, really early, before the sun woke up. As I sat on my couch, just sitting, not praying or reading my Bible, I felt a nudge to read a book on my coffee table waiting patiently for me to finish it. My thoughts were, “Really? You (God) want me to read that this morning? Not my Bible or Jesus Calling?” The nudge continued. So, I picked it up and opened to the bookmarked page. The book is entitled, Heaven is for Real. Maybe you’ve heard of it. It’s about a little boy’s experience of heaven. It’s a remarkable book, but what happened next was one of the sweetest kisses from Jesus I’ve received. As I read where I had left off, the dad (who is the author and narrator of the book) tells of the first time they told an audience of Colten’s experience. Afterward, he received an e-mail from the pastor of the church they had visited with a link to a CNN video of a young artist who has also experienced heaven. She has painted pictures of the face of Jesus. When he watched this video, he called for his son to come see the painting. Colten’s family were always asking him if paintings of Christ really looked like Jesus or not. He hadn’t found one that did. 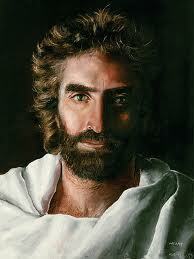 But when Colten looked at Akiane Kramarik’s painting, he was speechless. He confirmed that this was the face of Christ. This is what Jesus looked like when he saw Him in heaven. As I turned the pages of the book, Jesus acutally led me to His face. ps. click on Akiane Kramarik to view CNN’s interview. She was eight years old when she painted this.